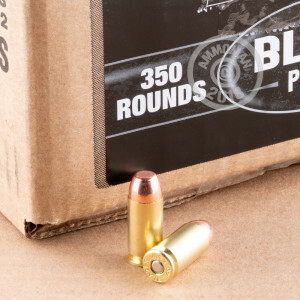 This 40 S&W cartridge from Blazer’s Brass line of ammunition features a 180 grain full metal jacket projectile, the original bullet weight offered by its caliber. While Blazer is best known for their aluminum cased ammunition, this cartridge’s casing is made of brass. That means you can handload it after firing it, and that ranges which have qualms about aluminum casings won’t find anything about it to get bent out of shape over. With its subsonic muzzle velocity it’s a lot easier on the ears, too. 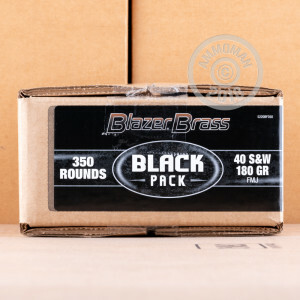 This Black pack is brimming with ammo. With 350 cartridges at your disposal you’ll have a nice little stockpile to sit on or just what you need for the mother of all range sessions. And remember, we ship for free on all orders of $99 or more -- pick up practically anything else on our site after you add this box to your cart, and the postage is gratis!